Angioplasty is the mechanical widening of blood vessel that is abnormally narrowed (stenosis) or totally obstructed (occlusion). Angioplasty has come to include all manner of vascular interventions typically performed in a minimally invasive or percutaneous (access via needle-puncture of the skin) method. Typically, it involves inflating balloons in the blood vessel to widen the vessel and using stents to provide structural support. Angioplasty reflects on the uniqueness of human beings, whose higher intelligence and creativity allows the development of this remarkable technology, allowing the extension of human life. However, while there are many causal factors for vessel narrowing and obstruction, including ones that cannot be controlled (genetic, age), in some cases the need for angioplasty represents a failure of individuals to address controllable risk factors, such as tobacco smoking, high blood pressure, obesity, and a sedentary lifestyle. The term angioplasty is a fusion of the words angio (from the Latin/Greek word meaning "vessel") and plasticos (Greek: "fit for molding"). Blood vessels are part of the cardiovascular system and function to transport blood throughout the body. The capillaries are the microscopic vessels that enable the actual exchange of water and chemicals between the blood and the tissues, while the conduit vessels, arteries and veins, carry blood away from the heart and through the capillaries or back towards the heart, respectively. At times these blood vessels can be narrowed by stenoses or blocked by occlusions. A stenosis (plural stenoses) is an abnormal narrowing in a blood vessel. Stenosis are often associated with a noise (bruit) resulting from turbulent flow over the narrowed blood vessel. This bruit can be made audible by a stethoscope. Other, more reliable methods of diagnosing a stenosis are imaging methods including ultrasound, Magnetic Resonance Imaging/Magnetic Resonance Angiography, Computed Tomography/CT-Angiography, which display anatomic imaging (i.e. the visible narrowing of a vessel), and/or flow phenomena (signs of the movement of the bodily fluid through the bodily structure). Occlusion is a term often used in medicine to refer to blood vessels, arteries or veins, which have become totally blocked to any blood flow. Often such obstructions are often caused by atherosclerosis. Atherosclerosis is a disease affecting arterial blood vessels. It is a chronic inflammatory response in the walls of arteries, in large part due to the deposition of lipoproteins (plasma proteins that carry cholesterol and triglycerides). It is commonly referred to as a "hardening" or "furring" of the arteries. It is caused by the formation of multiple plaques within the arteries. Angioplasty is a procedure to widen these narrowed or occluded arteries. Originally, the procedure was performed by inserting a stiff catheter through the narrow space, followed by larger and larger catheters (Proseus 2006). Today, minimally sized devices are used, where catheters contain balloons that are inflated to widen the vessel and stents (mesh of wire) are used in the vessel for structural support (Proseus 2006). Lasers may also be used to help break up the plaque and catheters may have spinning wires or drill trips to clean out the plaque (Preseus 2006). Essentially, the technique involves preparing a site of entry into the vessel, introduction of a guidewire and movement of the guidewire to the destination, inflating a balloon on the catheter that has been passed along the guidewire, and use of a stent for structural support. Most commonly, the Seldinger technique is used to cannulate a blood vessel for access. Once in position, the balloon is inflated using high hydraulic pressure so as to force the narrowed vessel lumen to expand, pushing the lesion producing the narrowing outwards. The balloon may also include a stent (compressed over the balloon before expansion) or be followed by a stent/balloon combination so that the expanded stent is left within the previously narrowed lumen to mechanically support patency of the vessel lumen. There are various types of angioplasty and the names of the procedures are related to the type of vessel entry and equipment used (Proseus 2006). Percutaneous transluminal angioplasty (PTA), for example, involves entry through the skin (percutaneous) and transluminal refers to the movement through the vessel of interest or one that communicates with it (Preseus 2006). 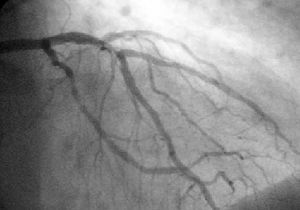 A coronary angiogram (an X-ray with radio-opaque contrast in the coronary arteries) that shows the left coronary circulation. The distal left main coronary artery (LMCA) is in the left upper quadrant of the image. Its main branches (also visible) are the left circumflex artery (LCX), which courses top-to-bottom initially and then toward the centre-bottom, and the left anterior descending (LAD) artery, which courses from left-to-right on the image and then courses down the middle of the image to project underneath of the distal LCX. The LAD, as is usual, has two large diagonal branches, which arise at the centre-top of the image and course toward the centre-right of the image. Percutaneous coronary intervention (PCI), commonly known as coronary angioplasty, is a therapeutic procedure to treat the stenotic (narrowed) coronary arteries of the heart found in coronary heart disease. These stenotic segments are due to the build up of cholesterol-laden plaques that form due to atherosclerosis. PCI is usually performed by an invasive cardiologist. Percutaneous coronary intervention can be performed to reduce or eliminate the symptoms of coronary artery disease, including angina (chest pain), dyspnea (shortness of breath) on exertion, and congestive heart failure. PCI is also used to abort an acute myocardial infarction, and in some specific cases it may reduce mortality. Coronary angioplasty, also known as percutaneous transluminal coronary angioplasty (PTCA), was first developed in 1977 by Andreas Gruentzig. The procedure was quickly adopted by numerous cardiologists, and by the mid-1980s, many leading medical centers throughout the world were adopting the procedure as a treatment for coronary artery disease (CAD). Angioplasty is sometimes eponymously referred to as Dottering, after Dr. Charles Theodore Dotter, who, together with Dr. Melvin P. Judkins, first described angioplasty in 1964 (Dotter and Judkins 1964). As the range of procedures performed upon lumens of coronary arteries has widened, the name of the procedure has changed to percutaneous coronary intervention (PCI). Basically, in this technique, a wire is passed from the femoral artery in the leg (or, less commonly, from the radial artery or brachial artery in the arm) to beyond the area of the coronary artery that is being worked upon. Over this wire, a balloon catheter is passed into the segment that is to be opened up. The end of the catheter contains a small folded balloon. When the balloon is hydraulically inflated, it compresses the atheromatous plaque and stretches the artery wall to expand. At the same time, if an expandable wire mesh tube (stent) was on the balloon, then the stent will be implanted (left behind) to support the new stretched open position of the artery from the inside. In coronary angioplasty, the angioplasty and stenting typically is performed through a thin flexible catheter during Cardiac Catheterization with just a local anaesthetic to the groin (or wrist) where the catheter was inserted, often making heart surgery unnecessary. While coronary angioplasty has consistently been shown to reduce symptoms due to coronary artery disease and to reduce cardiac ischemia, it has not been shown in large trials to reduce mortality due to coronary artery disease, except in patients being treated for a heart attack acutely (also called primary angioplasty). There is a small but definite mortality benefit (i.e., reduction) with this form of treatment compared with medical therapy, usually consisting of thrombolytic ("clot busting") medication. Peripheral angioplasty refers to the use of mechanical widening in opening blood vessels other than the coronary arteries. It is often called percutaneous transluminal angioplasty, or PTA for short. PTA is most commonly done to treat narrowings in the leg arteries, especially the common iliac, external iliac, superficial femoral, and popliteal arteries. PTA can also be done to treat narrowings in veins. Atherosclerotic obstruction of the renal artery can be treated with angioplasty of the renal artery (percutaneous transluminal renal angioplasty, PTRA). Renal artery stenosis can lead to hypertension and loss of renal function. Generally, carotid artery stenosis is treated with angioplasty and stenting for high-risk patients in many hospitals. It has changed in the United States since the Food and Drug Administration has approved the first carotid stent system (Cordis) in July 2004 and the second (Guidant) in August 2004. The system comprises a stent along with an embolic capture device designed to reduce or trap emboli and clot debris. Angioplasty and stenting is increasingly being used to also treat carotid stenosis, with success rates similar to carotid endarterectomy surgery. Simple angioplasty without stenting is falling out of favor in this vascular bed. SAPPHIRE, a large trial comparing carotid endarterectomy and carotid stenting with the Cordis stent found stenting non-inferior to carotid endarterectomy (Yadav et al. 2004). Dotter, C. T., and M. P. Judkins. 1964. Transluminal treatment of arteriosclerotic obstruction. Description of a new technic and a preliminary report of its application Circulation 30: 654-70. Retrieved January 6, 2008. Proseus, E. R. 2006. Angioplasty. In J. L. Longe, The Gale Encyclopedia of Medicine. Detroit: Thomson Gale. ISBN 1414403682. What Is Coronary Angioplasty? National Heart Lung and Blood Institute, Diseases and Conditions Index. Heart & Vascular Cleveland Clinic. Angioplasty.Org celebrating a decade of independent cardiology news and education. This page was last modified on 21 March 2016, at 15:12.